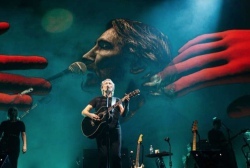 Some great news for our friends in Costa Rica - the Roger Waters 2018 Us + Them tour is coming to their country, with tickets going on sale next month. Roger will be performing at the 35,000 capacity Estadio Nacional de Costa Rica. The regular sale of tickets starts Monday, May 7th, via eticket.cr or the direct links below [click 'TICKETS']. Those in Peru have been patiently waiting for details of the show which was announced for Lima, when the South American leg was revealed, and that has finally been confirmed as being at the huge Estadio Monumental "U". Tickets for this go on sale on Friday, May 4th, via Teleticket.com.pe. Finally, for our friends in Argentina, there's a second night at the Estadio Unico de la Plata in Buenos Aires, which goes on sale on Wednesday, April 25th through Ticketek.com.ar.